a group of people who have the same interests, religion, race, etc. When I think about developing a community of writers I consider how we will learn together as a classroom of writers and how we will learn and collaborate beyond our classroom. Being a part of a community builds confidence, inspires new ideas, and teaches perspective. What is a Writing Community? A writing community is a group of writers who are working together to learn more about the life of being a writer. They work to understand how writers get ideas, how they capture small moments, how writers collaborate, and how they share their work, just to name a few. Through reading and collaboration, writers find fresh ideas, give and receive feedback, and study the work of authors. Writers are free to find their own process and techniques with the support of their community. Time-How much time do writers need to think, plan, compose, and share? Space- What type of space do you prefer to work in? Noise level- What is and is not an acceptable volume level during writing time? Sharing- Who is my audience? Who do I choose to share with? Why do I share my work? Use and sharing of tools- What tools help to best create my message? Common language- understanding and using common terminology to improve communication and understanding. Common and Individual goals- class goals and Individual goals to improve skills and practice as a writer. Conferring- Am I ready to conference? Who will I confer with, why? Celebrations- How can I celebrate my process, my work and when do I choose to celebrate? 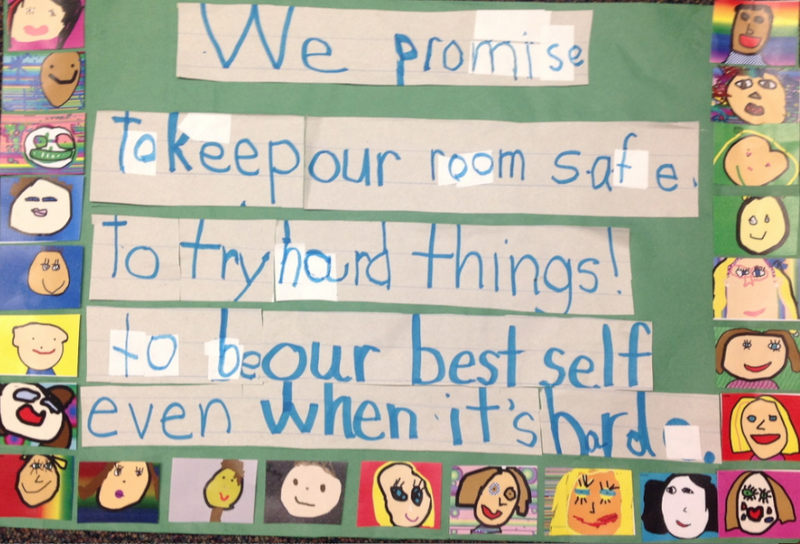 As we learn about ourselves, our peers, and our community we begin to establish common expectations for our classroom. We discuss, chart, and role play our expectations. We discuss what our expectations look like and what they don’t look like. I have found that contrasting the behaviors we expect helps students not only develop a clear understanding of what is appropriate, but it also helps the students understand why these expectations are important. I often create T charts with the students. One side of the T-chart is labeled “Writers DO… and the other side Writers Do Not…” This chart provides students with a visual reminder of our conversation to refer to when needed. During the first six weeks we also learn what it means to be collaborative and HOW to be a listener. I have found students are frequently directed to listen, but few are TAUGHT what it means to be a listener. We begin each day with a morning meeting. We gather in a circle where each and every student is visible to everyone. We begin by passing good morning greetings around the circle. As students share their greetings, we practice looking at the person you are speaking to. We learn to use voices that can be heard around the circle and to look at others as they are speaking, even when it isn’t our turn. Collaboration requires a deeper level of listening. Listeners are required to think about what the speaker is saying, to connect their thoughts, and ask questions when we are confused. We learn to comment back to the speaker, maintaining the topic of conversation. These skills are difficult for adults, but essential in a community of learners so we take time to define them, teach them, and practice them every day. Collaboration is just one element of our writing community. Knowing each other as writers is also important. Knowing the interest of our peers, their writing preferences, and the voices of the writers around us enables us to bond as a community. Mini-Me represents the interest of the child and serve as ideas for writing and an introduction of the student to the class.a feeling of belonging. 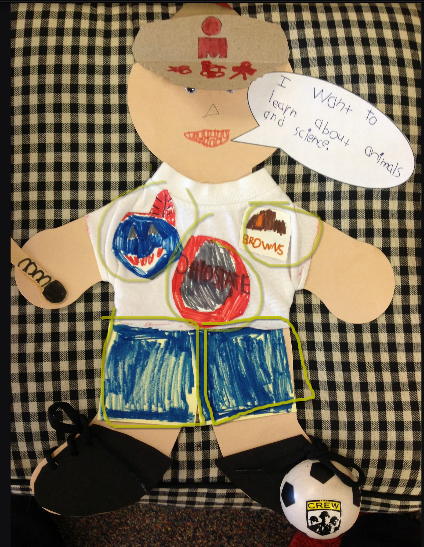 At the start of the year, each student creates a paper doll adorned with pictures, uniforms, costumes, buttons, ribbons, glitter or whatever families choose. We refer to these paper dolls as “mini-me’s”. Each item placed on the paper doll represents an interest of the child. As these are returned to school the students share the doll and tell the group all about themselves and their interests. As the child is sharing with the class, I record the conversation in VoiceThread. I snap a photo of the paper doll and record the sharing so we can refer to the conversation and ,if desired,leave a comment asking for more information or to share a common interest. Students love revisiting this recording throughout the year and will often leave new comments as the year progresses. Once mini-me’s are shared they are hung on the wall in the room. As kids are writing they can refer to their mini me’s or those of their peers for writing ideas and writers with shared interest. In our quest to learn about the writers in our community, we also create a border for our writing display board. While in our morning meeting I begin to ask seemingly random questions about popular hobbies or interest in our room. I might ask, “Who in our class likes to cook?” Several hands shoot into the air. I ask them to tell us about cooking and other friends begin to connect and share their stories, after a while the room is abuzz with cooking stories. Now I ask, “Is this something you could write a story about?” The group nods with eyes wide and big toothless smiles! I hand the group a sentence strip labeled “cooking” and ask them to draw pictures of cooking, filling the sentence strip. Once the sentence strip is finished I place the strip on the border the writing board. Now we have a group of kids with a common interest as well as a reminder of our cooking friends and ideas to write about! Members of writing communities share common language and goals. In our writing community we build language and goals through minilessons, books we share, and classroom experiences. Sharing books, authors, and characters leads to conversations unique to our community. These common experiences and conversations bond our class around story. Writers feel accepted and feel free to take risks in writing and are brave to share with others. These bonds allow writers to seek and accept feedback in a way that will support writing growth. Because writers of a community are inspired by the work of other authors we make time to learn about authors we admire. When possible we reach out to them on Twitter, visit their web pages to learn about the authors’ work space, how they get their ideas, the tools they use, decisions they make, and other interesting information they may share on their websites. As a member of a writing community, students work with common language and understanding. Students know the writers within the community and feel comfortable asking for feedback and offering feedback that serves to push the writer, not to flatter them. Writers within a community understand the importance of their writing community and work to maintain its existence. Because the students value their writing community, they also feel accepted and free to try new ideas, take risks, and push themselves to be their personal best. They feel encouraged internally and externally. I will use the “Mini-me” tool to further my writers understanding of responsibility, voice, and opportunity to foster our writing community this school year! I just love looking at the Mini-Me’s throughout the year to learn more about the kids! They are worth their weight in gold! Wow, I love the community of writers I see in these comments. Great post for starting a new year, Deb. Kathleen, thanks for giving more ideas about QR codes and Audioboom. I love the mini me idea not only as a way to share about self and grow community but to refer back to for writing ideas. I love the way you pulled all the comments together! So many great ideas from our community of writers right here! LOVE IT! What a fantastic post! I find myself referring to this blog often as I am a fourth year teacher just beginning my journey with Workshop! I really enjoy these ideas to help build classroom community. I am really working towards a strong bond in the classroom, these ideas are realistic and can be implemented in the very beginning. I love that! Thank you both so much. Your work is really helping me. 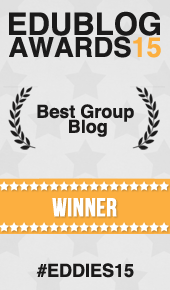 I am so glad you found this great blog, so many reflective people sharing their brilliant thoughts! I have found Responsive Classroom and their book The First Six Weeks instrumental in establishing community. I highly recommend this book to everyone! Good Luck, reflect in writing each day you can, this will drive your learning and teaching! ~The value of rich conversation, lead by thoughtfully selected teacher questioning, throughout the community building and writing process. ~Helping students understand how personal writing should be. ~Helping students understand that everyone is unique, but there are others in the room with common interests. We can use those commonalities to support each other, and differences to learn from each other. ~The importance of going slow in the beginning of the year, and taking time to simply GET TO KNOW EACH OTHER!!! WOW! I am so impressed with all you pulled from this post! So happy to know these are the messages you found and are taking away. As I write I always wonder what messages I am sending readers and hope they are helpful to others. Have a great year Adriana- we really need to schedule coffee or something to talk school! I love your ideas here! I have cut white border that my students will create in the next few weeks- I knew what I wanted some of the border to contain (favorite authors/books on the reading board, for example), but I LOVE your writing border idea! I love learning from this blog. There are so many ideas here for establishing a writing community! The sentence strip border of ideas is brilliant! I don’t know Voice Thread but will look into it. I recently discovered Audioboom and making QR codes with a voice recording. I was thinking those adorable mini mes could have a QR code on them and the kids could listen to the presentation that way too! The message your students crafted about working hard and being their best selves was a great class promise! Thanks for stopping by to share your ideas! I don’t know audioboom, I am adding this to my list to explore. LOVE the idea of QR Codes! I just can’t wait to get started again this year!